Carpal tunnel syndrome is a condition that arises from pressure against the median nerve that passes through the carpal tunnel in the wrist. Conditions that cause this syndrome may include pain or inflammation of the joints and soft tissues in the arm from obesity, rheumatoid arthritis, gout, diabetes, lupus or dislocated bones. Work or exercise related injuries from repetitive hand and wrist movements can also cause swelling in the surrounding tendons. Symptoms can range from moderate to severe pain, numbness, and weakness in the wrist and hand. 1. 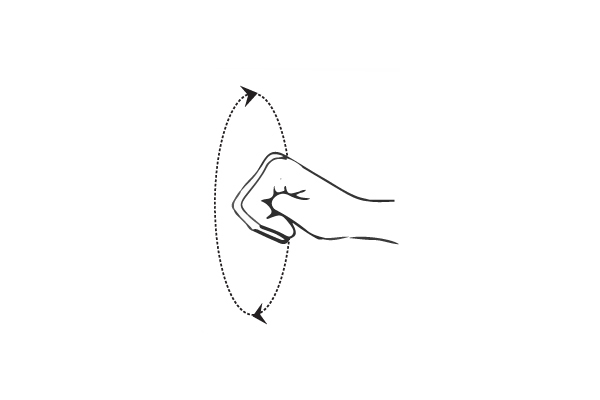 Rotate your wrist up, down, and from side to side. Repeat 4 times. 2. 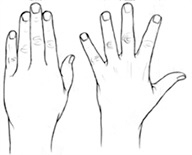 Stretch your fingers far apart and then relax them. Repeat 4 times. 3. Hold a prayer position for 30 seconds by putting your hands together in front of your stomach near the waistline. Repeat 4 times. 4. 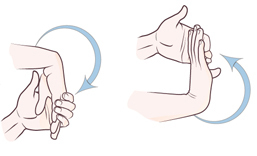 Stretch your wrist by extending one arm straight in front of you with the palm facing the floor. Then using the other hand, gently bend the downward facing hand until you reach your maximum point of flexibility. Hold this position for 30 seconds, alternate hands, and repeat about 2 times on each side. See image below. 5. 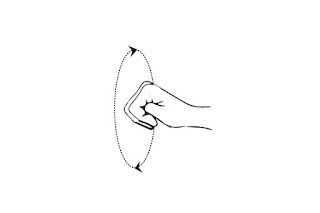 Similar to stretch #4, extend one arm straight out in front of you but with the palm facing up. 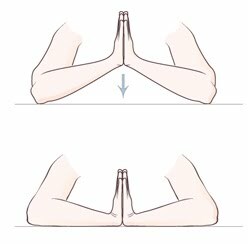 Then using the other hand, gently bend the upward facing hand until you reach maximum range of motion and hold for 30 seconds, alternate hands, repeat about 2 times on each side. See image above.